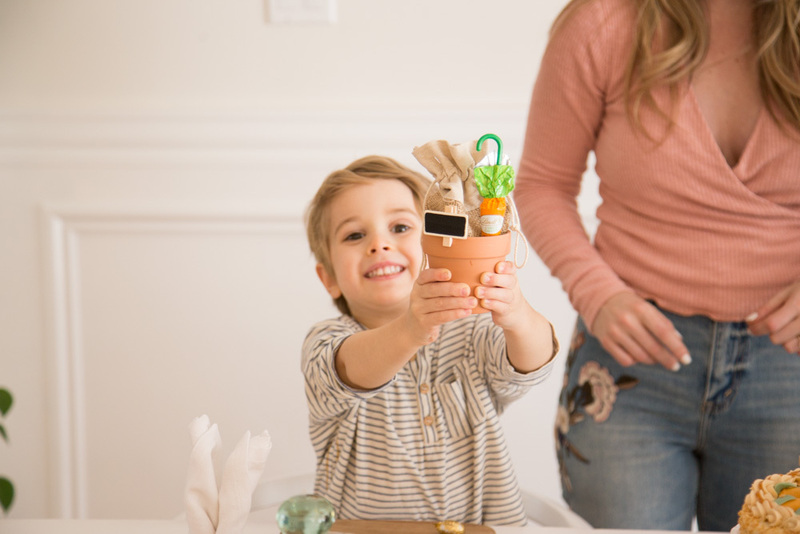 Easter is such a fun time of year for our entire family, it’s when our crafting and DIY juices are flowing and the beautiful smell of Spring is in the air brightening our spirits after a cold winter in Canada. Or could it be the smell of the delicious chocolates and baked goods? Either way – we all have big smiles on our faces! This year we’ve partnered with Lindt Canada to share a fun family Easter moment with crafts and recipes and our favourite gold bunny. 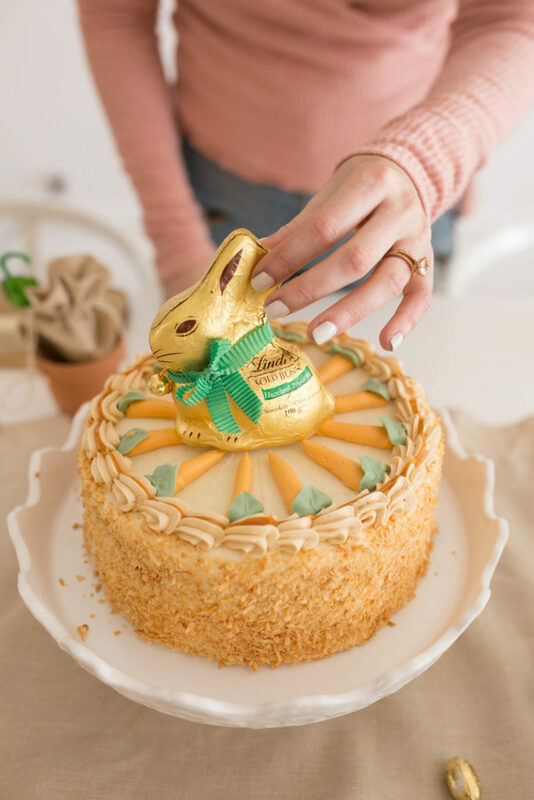 The iconic LINDT GOLD BUNNY was created by Lindt’s Maitres Chocolatiers in 1952 to capture the joy of Easter – did you know that? The super cute bunny with the adorable red ribbon bow and a gold bell. 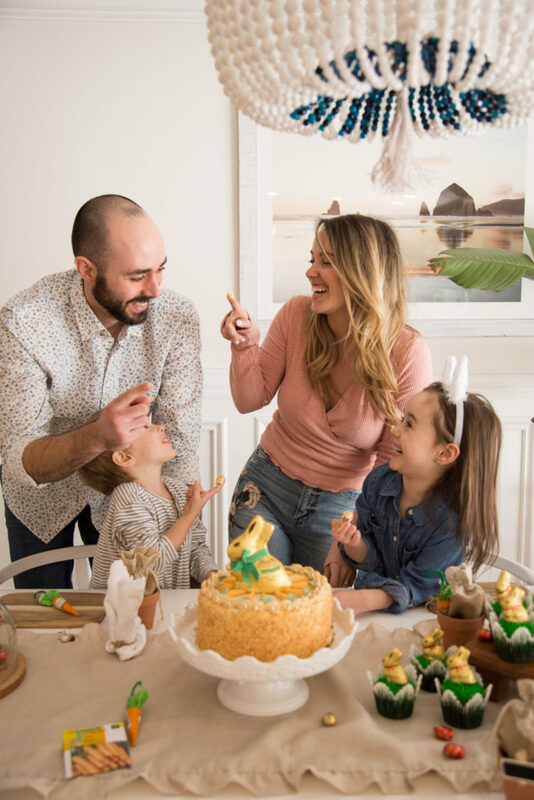 Lindt Canada has a super cute story book app available in the app store right now called “The Bell that Rang in Easter”, it shares a precious story about a bunny that was forgotten and then found by a sweet little girl and how their magical friendship sparked an Easter tradition. 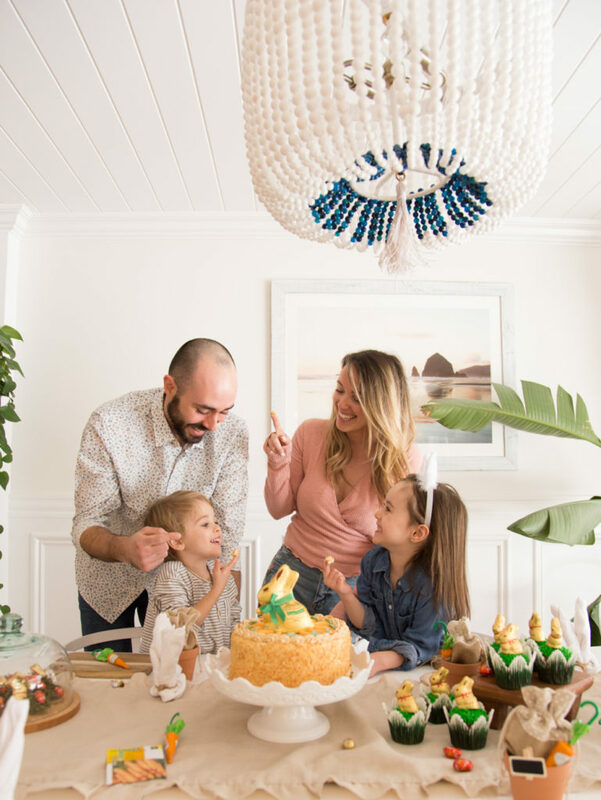 – a tradition which is the story behind the delicious gold bunny with the red ribbon & bell. The story was written by award-winning Canadian author Ashley Spires! I don’t want to give away the story so you will have to checkout the story book app by visiting www.goldbunnystory.com to read it yourselves. 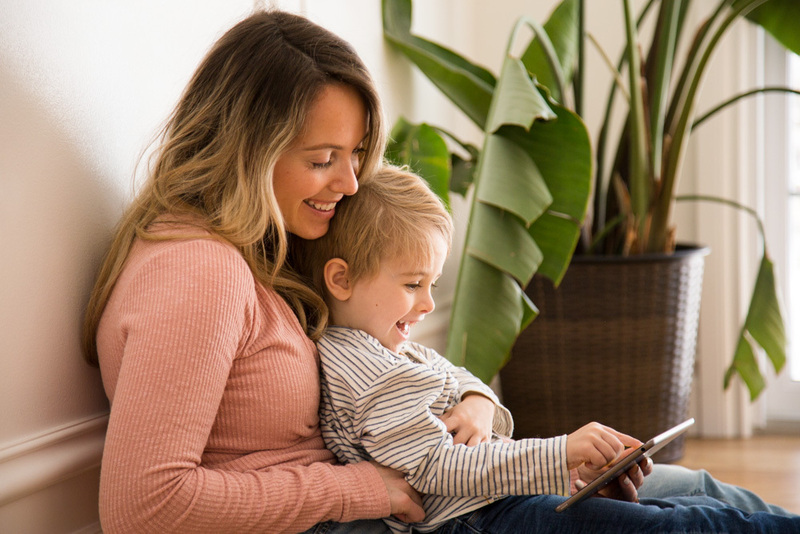 It’s a very fun and interactive story you can read with the kids – they will love it! And then you can all bake together or try one of our crafts, or even one of your own this Easter once you know the story. I love that it teaches the values of giving and friendship! 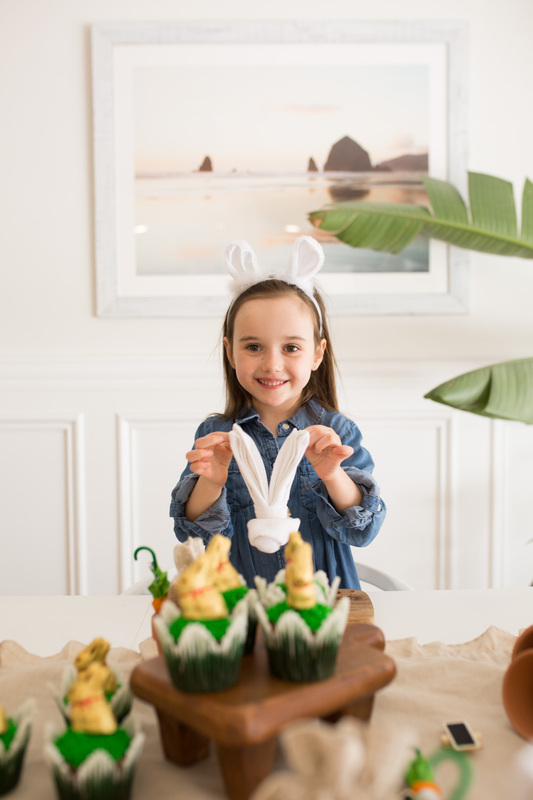 This family fun was one of my favourite Easters I have to say so far, the kids are at a perfect age to really get involved in crafts and show their creativity and to understand this time of year as well. 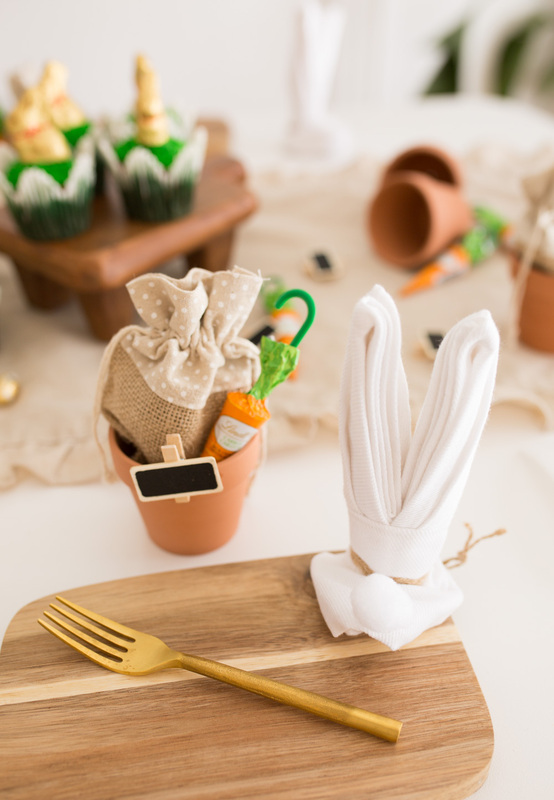 We wanted to make the bunny the theme around this set up so we did a variety of things. 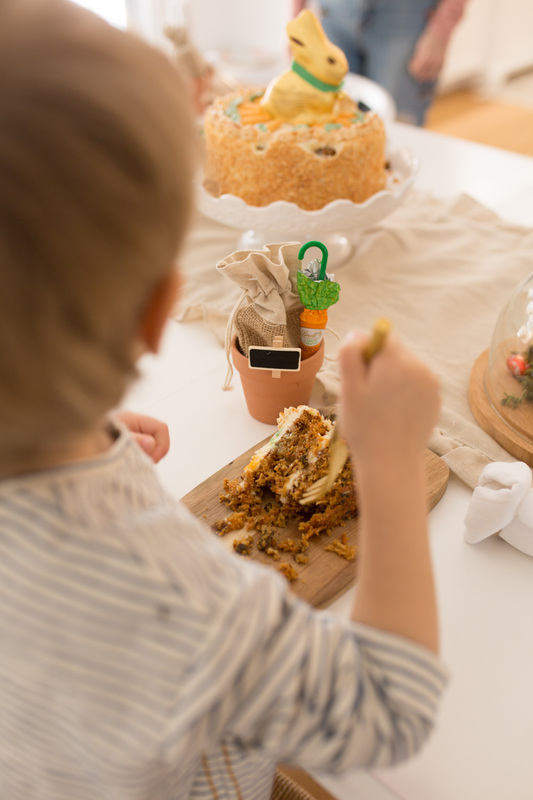 We baked a Hazelnut Lindt Chocolate Carrot Cake….my mouth is watering already just thinking about it, it was SO good!!! 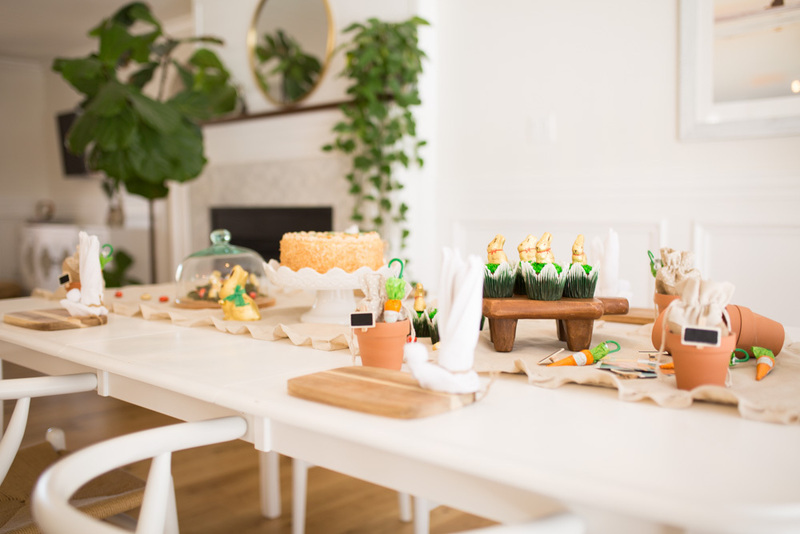 That was our centrepiece for the table – I love a beautiful cake to be the focus of a tablescape and the LINDT GOLD BUNNY on top…”took the cake” haha! 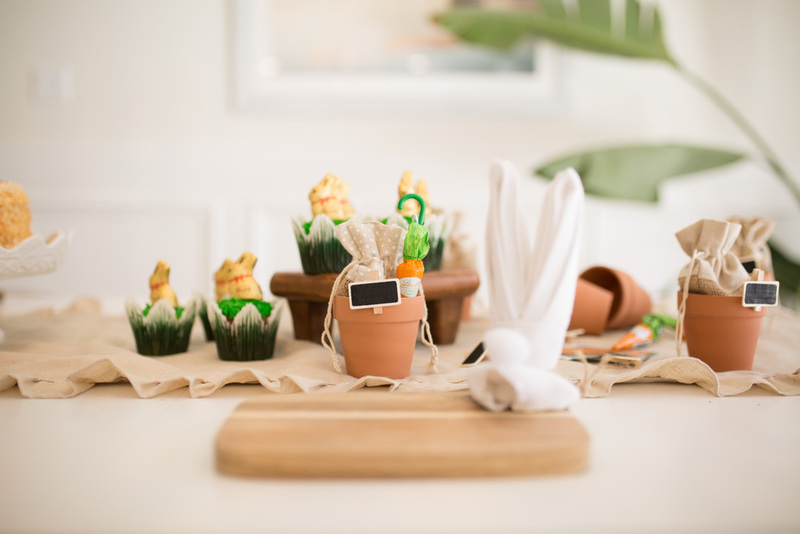 We baked chocolate cupcakes in greenery cupcake holders with grass icing for the little LINDT GOLD BUNNY to sit on top. 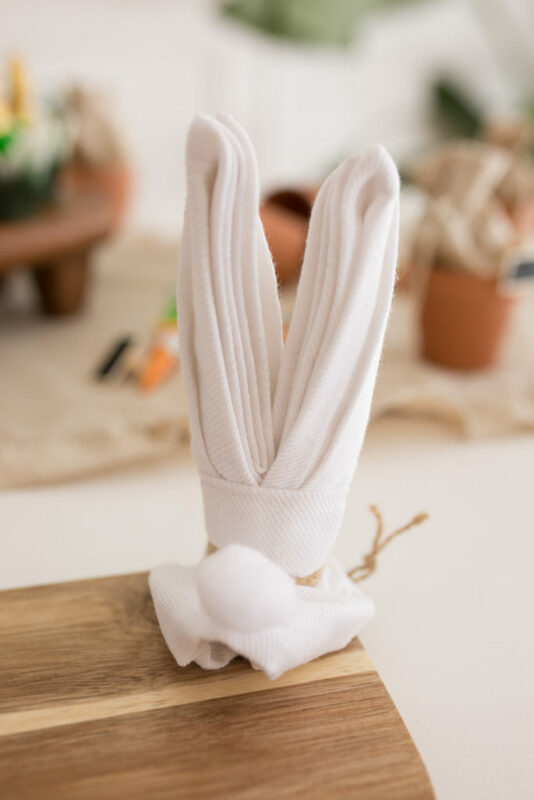 We made sure our napkins were in the shape of bunnies (crazy easy guys I promise) and lastly we had a fun craft for the kids to do for their cousins & Ella’s teachers! 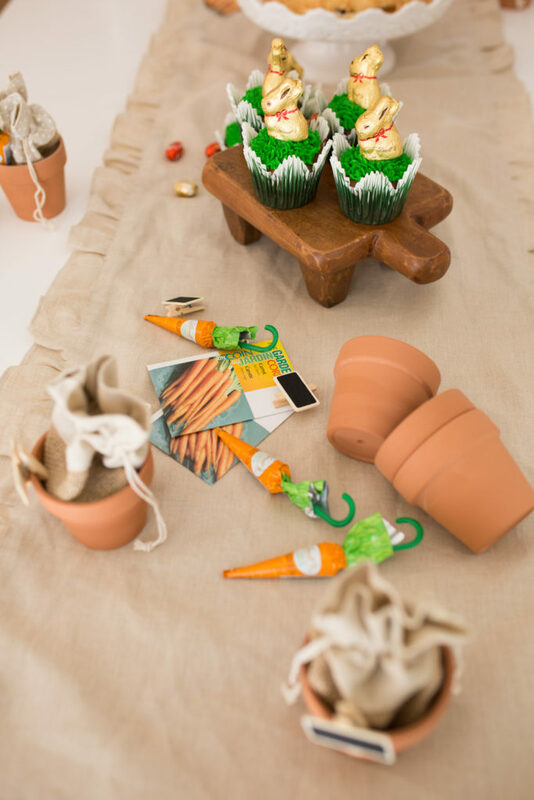 We picked up carrot seeds from our local greenhouse and some tiny terracotta vases & burlap bags – we put the seeds inside to be planted by the receiver of the gift and of course we added a LINDT GOLD BUNNY and LINDOR EGGS & carrot shaped chocolate to it – we LOVED how they turned out, what do you guys think of it? 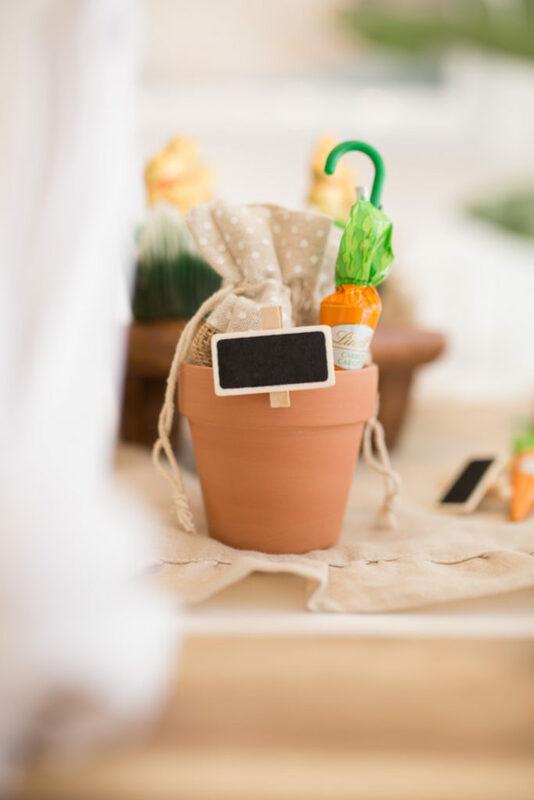 We even added super cute mini chalkboards to the little vases so the kids could write names on them for who they’d be giving them to. They were so very proud of this craft and Ella can’t wait to hand them out! You could even add mini LINDOR eggs into the bag if you wanted to make your gift extra “chocolatey” haha! The LINDT GOLD BUNNY products are available in a bunch of sizes and different price points, they even have a huge one that is 1kg in size! Imagine opening up that for Easter…currently drooling here. 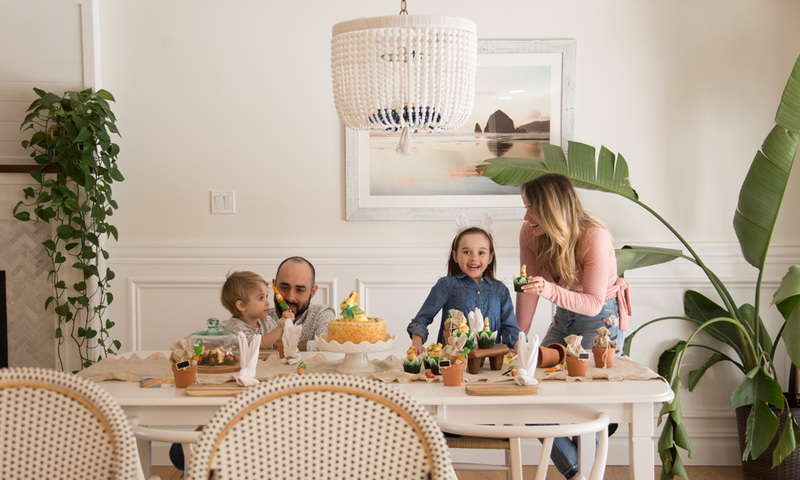 We wanted to incorporate the LINDOR chocolate eggs into our decor also so I found a cloche set in our pantry and set it up with faux moss and mini GOLD BUNNY (a few of them) and the LINDOR chocolate eggs – Noah helped place everything inside and it was a great way for him to help set the table. 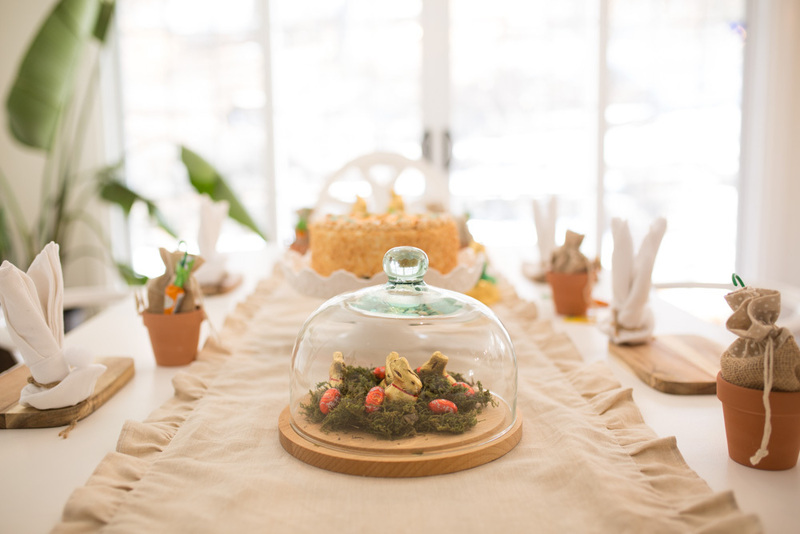 It’s a very simple touch but cloches are a great way to incorporate some delicious Easter decor on your table when having guests over, the kids that have come by always ask about it! 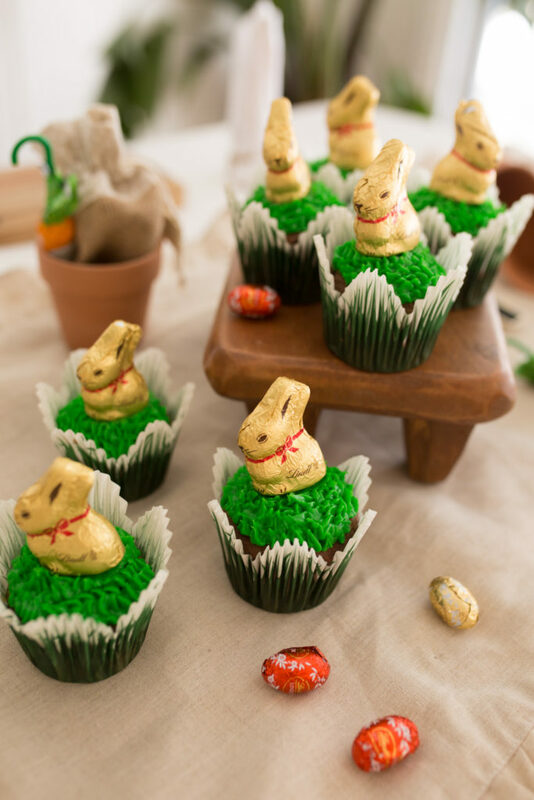 What are your plans this Easter with your little ones? 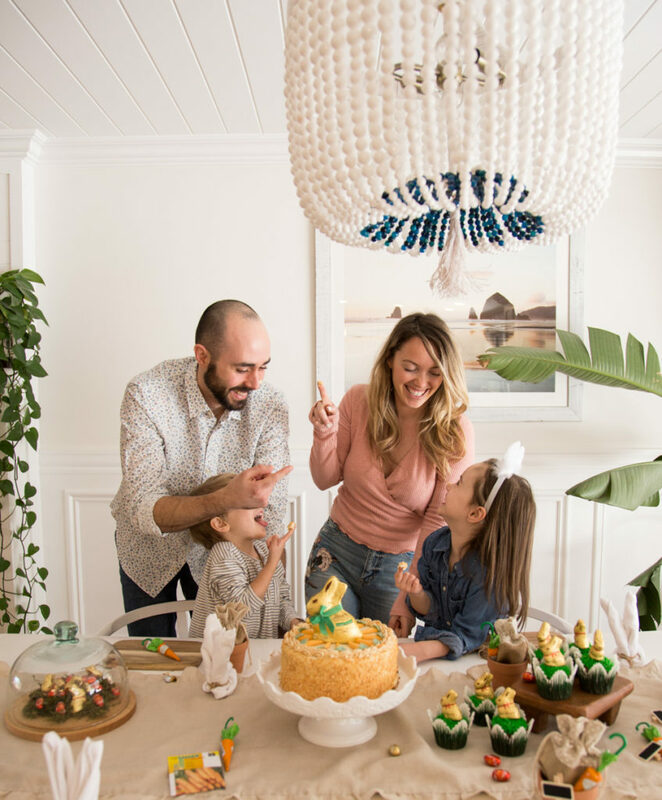 DO you have any traditions you do with the family? 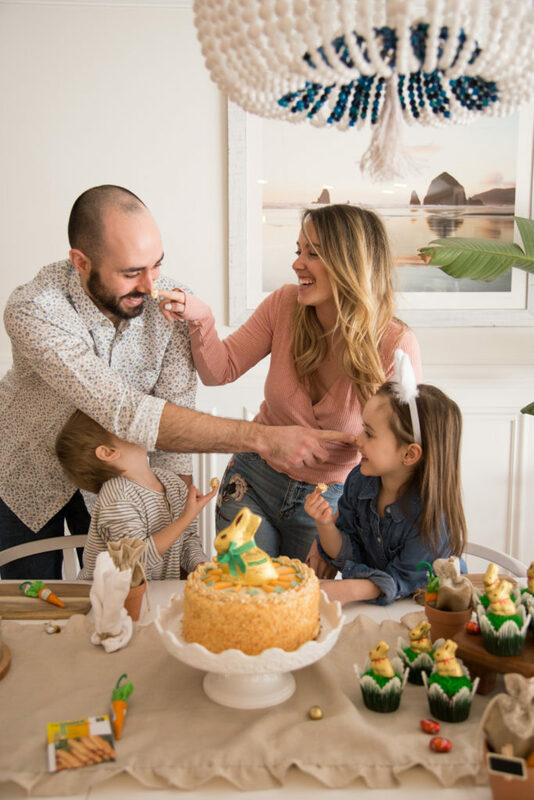 We love to all bake together! 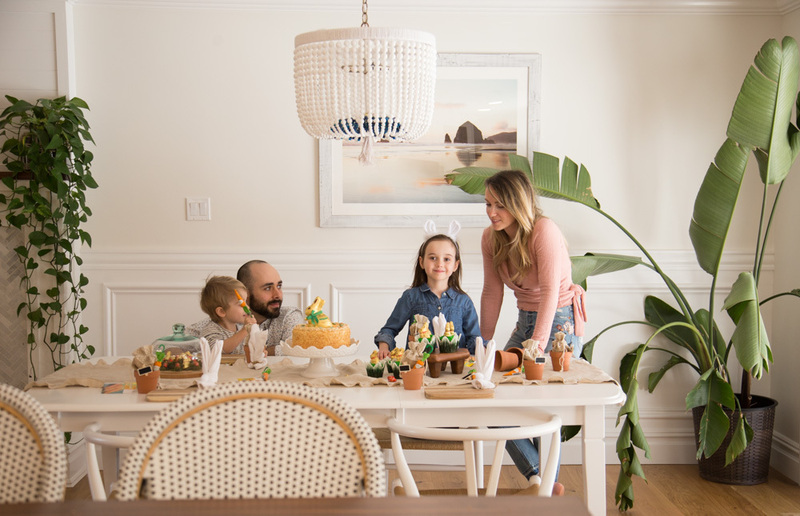 A lot of our family time is spent in the kitchen since both Craig and I love to cook, he actually did all of the grass like icing on the cupcakes and basically took charge on the cake baking too while I crafted with the kids…team work right? 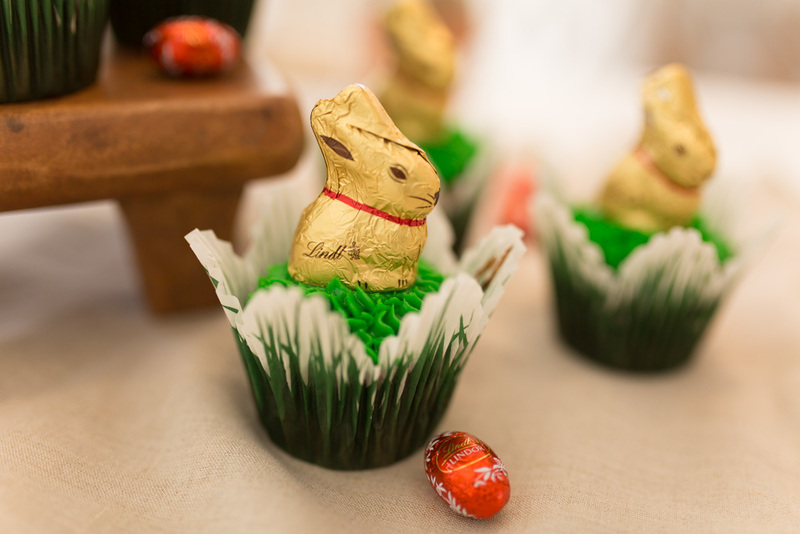 There is a fun LINDT GOLD BUNNY event taking place at Square One Shopping Mall in Mississauga, ON from March 23-31st. 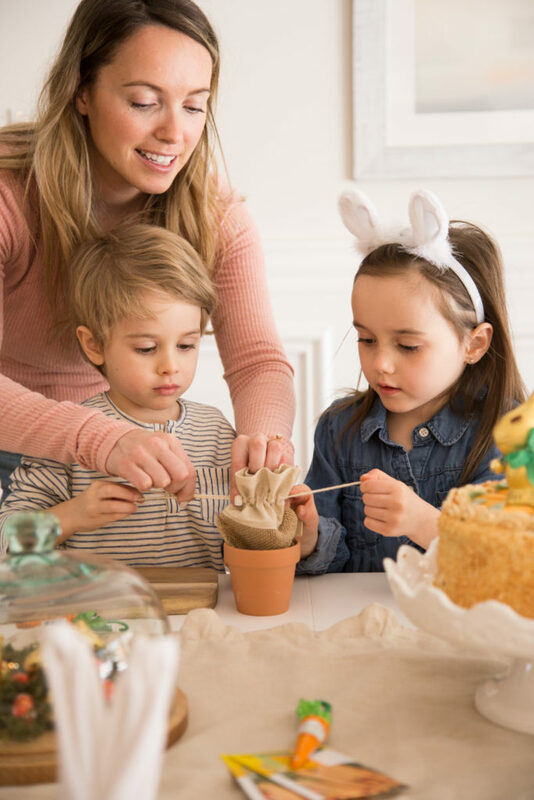 Here families can enjoy live story telling of the Bell that Rang in Easter, receive a personalized GOLD BUNNY ribbon and participate in fun, interactive activities. 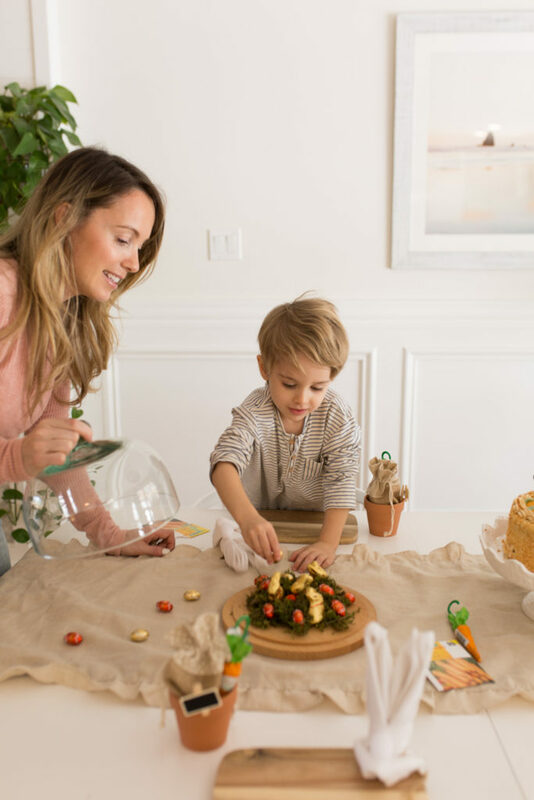 You can also learn more about how to celebrate with Lindt this Easter by visiting their website here! This blog post was sponsored by Lindt Canada, all opinions are always my own.